From the start of April, this rainbow trout fishery near Saintfield will be open in the evening until dusk or 10.00pm, whichever is the earliest. With the better weather the boats are in use more often and are free of charge Monday to Thursday. 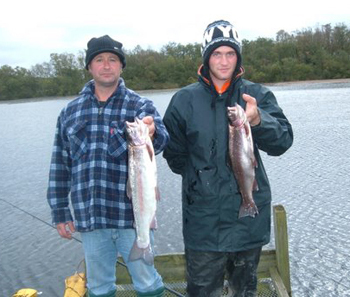 Carrickmannon Fishery provides plenty of sport for local anglers. Fly fishing has been the most popular method over the past few weeks with Damsel Nymph, Hare’s Ear and Cat’s Whisker being the most successful. Billy Campbell from Belfast was top on catch and release when he hooked forty-two fish. Martin Craig from Holywood caught twenty, Eugene Toner from Carryduff caught fifteen and Ian Duncan from Holywood had twelve, and Paul Hilditch from Killyleagh also had twelve. Some anglers have reported a number of large over-wintered fish in the lake, these have caused a few broken lines but managed to evade capture. Among the catches was Gerry King from Belfast with two for 5lbs. Aaron Finlay from Belfast had two for 4lbs. Tony Cairnduff from Killinchy also had two for 4lbs. Alan Toner from Carryduff caught three for 5lbs. Paul McConville from Carryduff had two for 4lbs. Julie Steen from Newtownards took three for 6lbs and Timothy McDowell from Belfast had four for 6lb. On the Children’s Pond Josh Ellis from Belfast had five, Scott Smart from Moneyreagh had three and Thomas Coogan from Belfast caught two.